I have a 1987 911 Cabriolet that hasn't set foot on the road for several years. I do start it up occasionally and run it up and down the drive but I cannot remember the last time I lowered the roof. Today, I tried to lower the roof but, when I pressed the button, the driver's side tried to lift from the top of the windscreen as normal but the passenger side of the hood remained firmly connected to the top of the screen. Theres a motor there with an internal switch so it could be that unit , theres a switch on the frame which could be faulty or it could be a control unit issue . If your happy to dig out a meter and start testing things then i found a wireing diagram that seems to be the right one for your car which i can send to you . Yes, a wiring diagram would be very useful, thank you. Do I send you my email address by private message… or what? Please .. and ill send you what i have . Info received – thank you very much. The situation appears to be that the passenger-side roof-lock is not disengaging when I press the roof button. There are two slots (left-hand side and right-hand side) into which I can insert a screwdriver in order to open/close the locks manually. When I insert a screwdriver blade into the driver's side slot and press the roof button, I can feel something whizzing round and touching the end of the blade as the roof begins to lift. However, when I do the same thing on the passenger side I can detect no internal movement at all and the roof remains fixed to the top of the screen. It looks like I might have to access the left-hand lock motor sooner or later. If I use a screwdriver to turn the left-hand lock mechanism until it parts company with the top of the screen and then use the roof button to unlock the right-hand side electrically, will that be okay? Im no expert on these im afraid .. ive worked on a 993 which i assume is the same and it was a pain to diagnose . If you can manually open the left lock then it should work if all the switches are in the correct postion .. if it doesnt operate the roof at this point then it would seem to be one of the micro switches .. you can see them in the diagram . It would appear you have no power to the motor left side so i would start with looking at that . yes you can manual the left side till its released then electric the right side .. open it basically .. with these then a bit at a time is best .. press the button then release and check everything is ok .. same again till its open . I've now managed to unlock the passenger side of the roof, using a screwdriver in the appropriate slot. I've also unlocked the driver's side using the roof button. Once the roof is fully unlocked, pressing the roof button causes the roof to lift and to move back to its fully open position. Pressing the roof button again causes the roof to lift and return to the top of the windscreen. At that point, the right-hand side locks down but the left-hand side doesn't. Interestingly, while I was tightening and untightening the left-hand roof lock, I noticed that pressing the roof button would cause the manual screw mechanism to rotate swiftly, just like the right-hand side lock mechanism does. That spinning is achievable only at certain points of the tightening/untightening process. The screw head doesn't have a sharp-edged slit to accept the tip of the screwdriver, it's more of a V-shape and I'm worried that that might be due to wear and tear on the screw. Accordingly, I've left the roof in the closed position, but not tightened down on the top of the windscreen just in case it becomes impossible to untighten it manually with the screwdriver. Any ideas as to what should be my next step would be much appreciated. This morning, I opened the roof fully to make everything easier to get to and then turned the faulty latch to the fully-open position with a screwdriver. I then pressed the button to close the roof and it worked perfectly, raising itself and locking itself down to the top of the windscreen on both sides. Hoping I'd somehow managed to fix it, I then pressed the button to open the roof but the faulty latch once again refused to detach itself from the top of the screen. I released the faulty latch with a screwdriver and opened the roof again. When I pressed the button to close it, the faulty latch did not attach itself to the top of the screen this time. Fiddling around with the faulty latch, I noticed that with just a little finger pressure I could rotate it through its full travel. The working latch, in stark contrast, is utterly immovable under finger pressure. Strange that it closed itself perfectly on that one occasion today. It wouldn't do so yesterday and hasn't done so since. There is a switch inside that tells the control unit the end stops of that motor .. thats what i think has failed . It didnt work , then after manually opening it did work and now doesnt .. the fault certainly sounds like its the motor switch or at least something on that unit . I think i would either strip it and see if it can be fixed or take a punt on a new one . From what i remember removal of it is a pain , ive only worked on a 993 but you had to get the arm in a certain position to be able to wiggle it out of the frame .. the lever part wont go through the hole basically . I've now removed the faulty latch motor and opened it up. To my surprise, there is no cam on the drive gear and no switch similar to that on the illustrations I can find online. The only electrical contacts are two springy copper arms that are non-adjustable. I have absolutely no idea how they are supposed to work. There is no obvious damage to any of the cogs. I have attached a pic. Having reassembled the motor, I turned the screw slot on the end of the motor shaft with a screwdriver and the latch opened and closed in response. I then pressed the button to raise the hood and it rose as normal but the faulty latch would not attach itself to the top of the screen. I pressed the button to raise the roof and the working latch disengaged from the top of the screen but the roof would not go back. I tried the button again and the working latch rotated (although it was some inches from the top of the screen). I then disconnected the faulty motor, pressed the button and the roof went back perfectly. Having again removed the motor after this failure, I tested its function by turning the screw slot with a screwdriver. 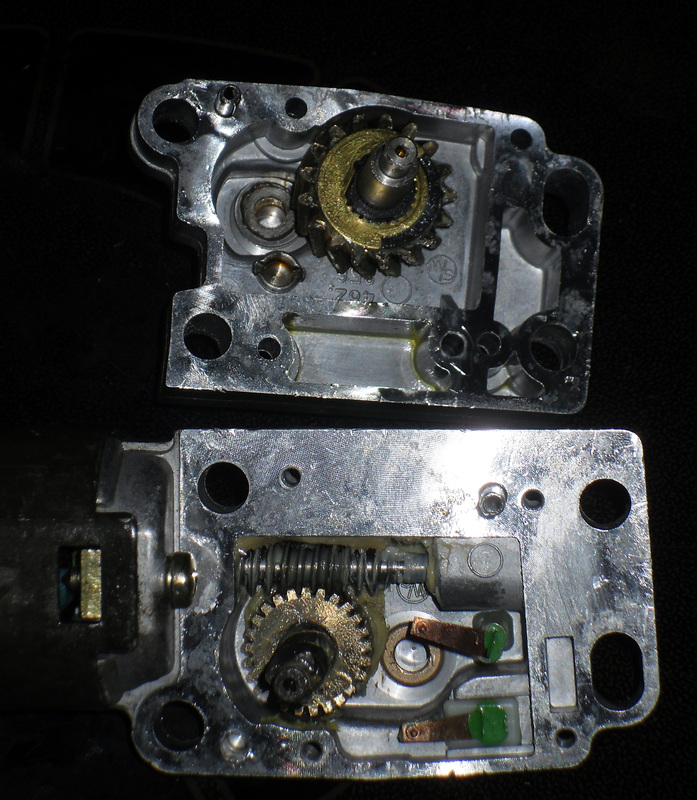 I was able to turn the worm gear as normal but the latch did not move – even though it had moved perfectly well when I tested it in this fashion before refitting it. I've now taken the motor apart again but I'm at a loss as to what to do next. It sounds to me that the roof is needing adjustment, are the latches at the front going in square and level when the roof is coming forward ?, there are also microswitches on the motors in the rear to tell the motors when to stop is one side stopping to early therefore not letting the roof latch settle down and operate. They are quite complex between the microswitches and control unit which is down in the pass footwell. I would check the front latches are lining up properly as the hood comes to its final resting place before latching in. I've just edited my previous post to make the situation a little clearer. Before I opened the motor casing, I tested the latch function by turning the screwdriver slot with a screwdriver. I was able to turn the screwdriver in the slot but the latch did not respond. After reassembling the casing, I performed the same test and the latch opened and closed perfectly. However, having refitted it to the hood and having had it fail to latch to the screen when tested, I again removed it from the car and tried it with the screwdriver. The screwdriver turned the slot normally but the latch would not respond in any way. It seems that, when I put the motor back in the car, the drive gear fails for some reason. Also, while I'm testing in the car, I have to press the button several times in order to unlatch the hood – as the good latch only works for two seconds at a time while unlatching. The button will lower the roof completely with one continuous press and raise it and latch it with one continuous press. However, when I'm unlatching, it takes three or four presses to get it done. The drive gear that meshes with the worm drive will slide up and down the shaft around which it is fitted. I don't know if it's possible for this drive gear to rise up and away from the worm gear when the case is closed. Also, if the splines joining that drive gear to its shaft are badly worn, they might be failing under pressure. In either of the above circumstances, the worm drive would not be able to transmit turning power to the latch. I've just tested the drive gear (that meshes to the worm drive) on the shaft to which it is spline-fitted and, although the fit is solid when I try to turn one against the other by hand, I find I can easily turn the gear on the shaft with very little pressure if I hold each part with a pair of pliers. Further examination reveals what looks very much like a crack in the drive gear. 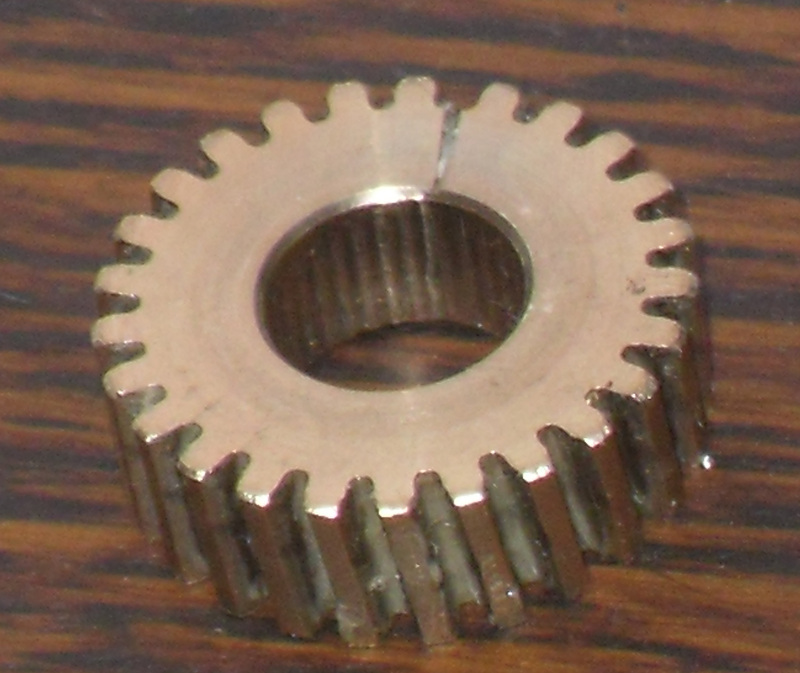 Also, the splines inside the drive gear look very well worn to me (but I've never seen a new one to compare it with). I've attached 3 pics and would welcome any comments. The inner part of that gear should have splines to lock it to the shaft .. i take it the gear doesnt free wheel ? How many wires goto that motor ? If only 2 then there IS not a switch even though the diagram says there is .. If 4 then there IS a switch .. 2 for the motor and 2 for the micro switch . The gear doesnt look split .. but it has a mark from the image .. if it locks to the shaft sline then its ok .
Can you power up the motor so that it spins .. connect some wires from the battery or use a power probe . Just a thought but can you fit the right hand motor to the wire plug for the left hand .. then operate .. if the right hand motor works when connected to the left side then its still that unit thats at fault . 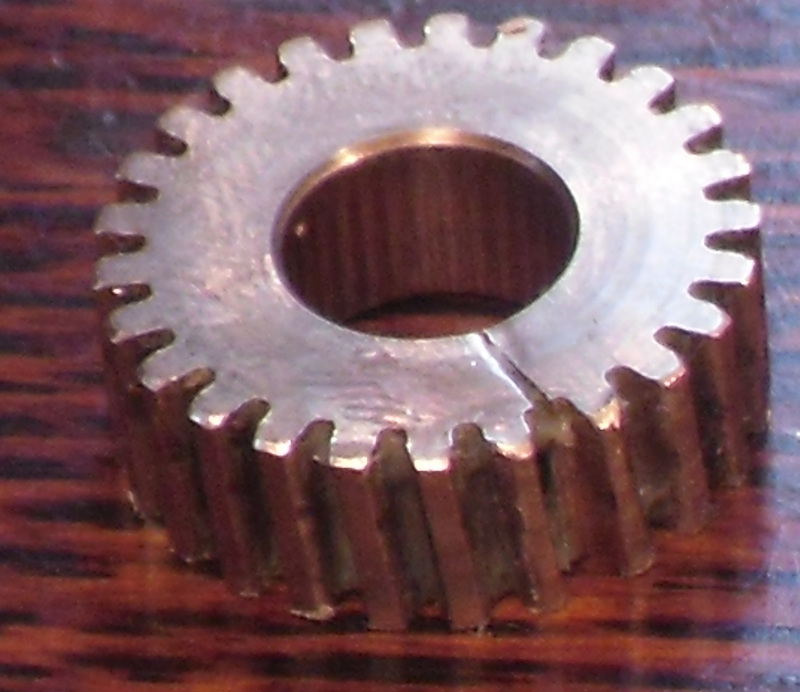 There are splines on the inside of the gear wheel but they look very worn to me. The gear wheel does turn its shaft but the grip between the two isn't great and if any big resistance is felt, the gear wheel jumps up the shaft, off the splines. There are four wires going to the motor. The motor does spin when the dash-switch is pressed. 4 wires means there is a switch there .. the motor only needs 2 .. positive and negative . Swop the motor side to side and see what it does . The gear should be tight on the shaft .. it has to drive a lever under tension at the end of the day .. if loose then its slipping and wont work . And i have to leave .. back tomorrow night . Your insistence that there is a switch has led me to examine the mechanism in greater detail. If you look at the pics I've posted, you will see there are two little arms made of copper. There is also a black strip lying along a short section of the outside edge of the gear wheel attached to the external latching mechanism. It must be the action of this black strip on those two copper terminals that acts as a switch. Yes? I'm not sure what you mean about swapping the motor side to side. I know it's receiving power when connected to its own side. I don't understand what more I can learn about it by connecting it to the other side. I'm no expert, as you can probably tell. In the meantime, I've reassembled the motor and refitted it to the hood. I pressed the button to close the hood and it rose perfectly, landed on the top of the screen as you would expect, and both latches began the closing procedure. The working latch closed perfectly but the faulty latch moved only halfway through its intended travel before giving up the ghost. Keeping my finger on the button caused the motor to keep spinning but the latch would not move any further forward – and it wouldn't move backwards either. My interpretation is that either the increasing resistance as the latch moved into its locking plate at the top of the windscreen caused the worm-driven gear to jumped up the shaft away from the splines (it does that when tested with the case open) or that the increased resistance was too much for the aforementioned splines and they simply started slipping. Having once more opened the drive motor casing, I can report that the drive gear had jumped up the shaft to a position where it was almost totally free from the shaft splines. I can also report that, when I push the gear wheel back down to its normal working position (fully engaged with the shaft splines), the gear wheel will turn independently of the shaft. 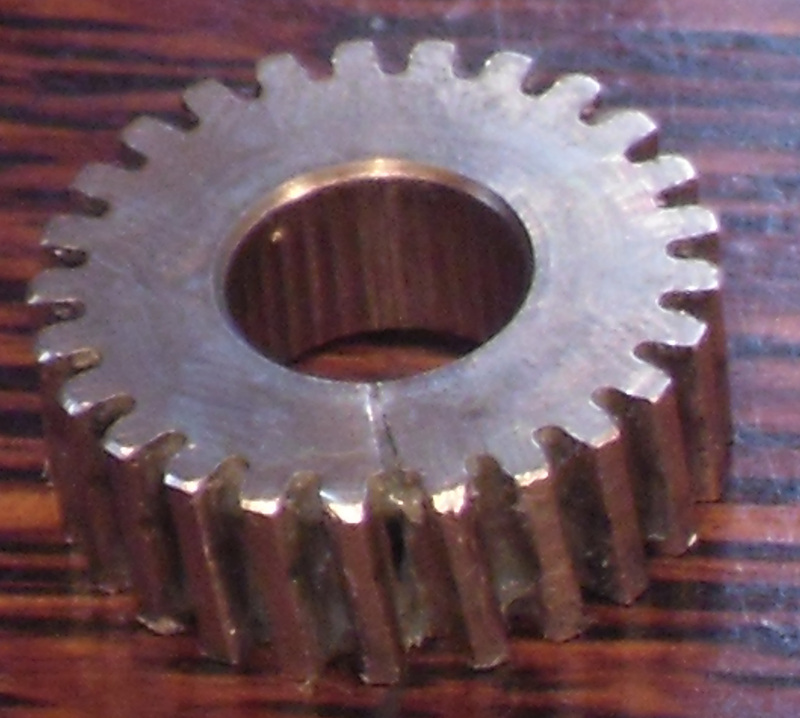 Looking again at the pics of the gear wheel, the splines do look as if they've been worn away to virtually nothing.